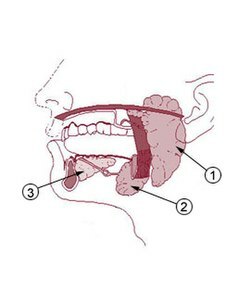 #1 is the Parotid gland; #2 is the Submandibular gland; #3 is the Sublingual gland. The salivary glands make saliva. Saliva keeps the mouth and other parts of the digestive system wet and slippery. They also help break down the food when you are chewing. This helps food go down the throat to the stomach. There are also many small glands in the tongue, cheeks, lips and palate. All of those glands make mucous. Saliva consists of two fluids, mucous and serous. Mucous (slime) is a saccharide glycoprotein called mucin. With water it makes the slippery lubricant used in many parts of the body, where it lines the moving parts, surfaces and tubes. Here it lubricates the mouth, throat and alimentary canal. The mucous also has antiseptic qualities: it contains lysozyme and immunoglobulins. Mucous, with its antiseptic molecules and slime, traps fungi, bacteria and viruses and prevent infections. The body produces about a litre of mucous per day, in the mouth and other places. The serous fluid contains the enzyme amylase which acts in the digestion of carbohydrates. Minor salivary glands on the tongue secrete the amylase. The parotid gland produces purely serous saliva. The other major salivary glands produce mixed (serous and mucus) saliva. Another type of serous fluid is secreted by the two layered serous membranes which line the body cavities. The serous fluid between the two layers acts as a lubricant and reduces friction from muscle movement. The parotid gland makes serous secretions only. The submandibular glands are mixed glands. They give serous and mucous secretions. The sublingual glands make mucous only. Serous cells are shaped like a pyramid. They are joined together in a group that is shaped like a ball. Mucous cells are usually shaped like a cube. They are joined together to make a tubules, which are very small tubes. Myoepithelial cells are all around the part of the gland where the saliva comes out. They can squeeze the saliva gland so the saliva comes out faster. The small tubes go into ducts. Those ducts go into larger ducts that have little stripes on them, called striations. Those go into ducts between the lobes of the gland (called interlobar or excretory ducts). The main duct of the salivary glands then opens into the mouth. The two parotid glands are near the ear (par- = next to, -otid = ear). They are the largest salivary glands. The sublingual gland is under the tongue. The submandibular gland is in the shape of a “U”. It is under the chin bone which is called the mandible. Ducts can get blocked. This would cause pain and swelling of the gland. Tumours of the salivary glands can occur. These are usually benign. Investigation is done by a sialogram, which is a radiocontrast study of a salivary duct. This page was last changed on 3 April 2018, at 23:11.